Harvested some leeks, scallions & herbs. They will be included in our Thanksgiving feast. The leeks are skinnier than I expected (were planted a bit too close together) but will still be delicious. The white parts will be used and the green parts placed in freezer bags for making broth at a later date. Scallions did very well this year and are still growing strong. Last year I direct sowed and the seeds did not germinate at all or maybe they did, and critters ate the seedlings. This year I started the seeds in cell packs and transplanted when they were a few inches tall, very successful. Will do the same next year. I was surprised the parsley and rosemary survived the killer frosts and frigid nighttime temperatures we had. Wondering how much longer they will remain in good condition. The sage and thyme are perennial. They are growing in a protected area in the back of the house and I can harvest throughout the winter as long as they are not buried under snow. If you are celebrating, have a wonderful time with family and friends around the Thanksgiving table. This entry was posted in Gardening, Harvest Monday, Herbs, Vegetables and tagged herbs, leeks, parsley, rosemary, sage, scallions, thyme. Bookmark the permalink. Your garden keeps giving and giving. 🙂 Have a nice Thanksgiving. It is a very unusual but exciting gardening year. Nice Thanksgiving to you too. Thanks, yes hope to see you soon. You have a very productive garden, Norma. Thanks, yes this year has been very productive. I thought of you this morning when I planted some rhubard seed I got from my sister-in-law and hope I can get them growing. Have a super week Norma and Happy Thanksgiving. The song popped into my head while I was harvesting. Do bring us up-to-date with the progress of your rhubarb. A super week to you too. My scallion experience matches yours. I get very few plants when I direct sow and every plant survives when I transplant. Slugs maybe? You are correct, could be slugs. We ARE celebrating this year and I couldn’t be happier. Your garden, even though it’s quittin’ time, still nurtures you. Fantastic. Happy Thanksgiving, Norma! Looking forward to reading about your celebration. This has been an amazing and interesting gardening year. Gosh, if I didn’t know the date I’d think it was a warmer month judging from your harvest today. 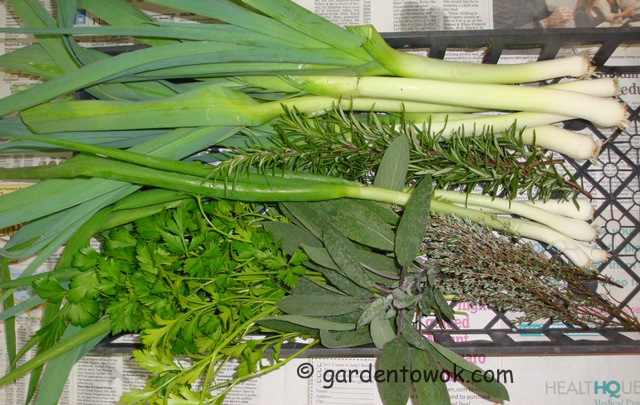 What beautiful leeks, scallions and herbs, and just in time for Thanksgiving. Hope yours is a very Happy Thanksgiving, Norma! Amazing isn’t it! An interesting year weather wise, but the late frost allowed for a longer growing and harvesting season. Oh I bet they all smell wonderful! How were the leeks from Morse this year? The leeks at Morse were wonderful this year. Will you be growing leeks in your community garden? Your growing season is so much longer. Nice pretty herbs, I don’t have luck in direct sow seeds of scallions, I always have to transplant them otherwise I’ll never see them. Thanks. Appears a number of gardeners have problem with direct sow, thought I was the only one. We can grow garlic and scallions, but I can’t get leeks to do anything but bolt. Very odd…. 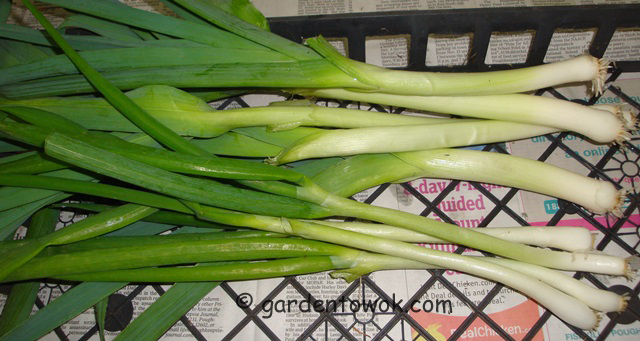 Perhaps if you start your leeks earlier indoors and transplant at the appropriate time it may work. Happy Thanksgiving to you too! I too will be picking herbs for Thanksgiving, but I think just sage and thyme. The rosemary gets to sit for a while longer. It may be the same where you are, but this year’s gardening season sure is interesting, so much late harvest and carrots seems to be bulking up still. Thanks. Yes, those leeks will be part of the Thanksgiving feast. 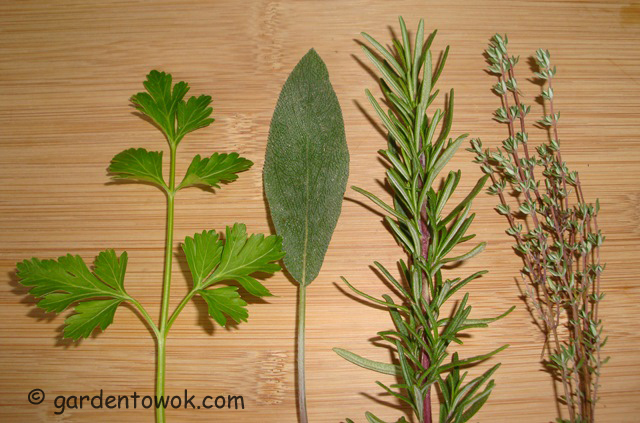 You can smell the different herbs every time you brush by one of them, yes it is wonderful. Happy thanksgiving to you too Norma. Hope you’re enjoying turkey and all the fixin’s. Your final-ish harvest looks great; I always have leeks in the freezer too. Love your reference to the Simon & Garfunkel song, nicely done. Yes there will be turkey and all the fixings and pies and more pies. Must remember to pace myself. The song just popped into my head when I was gathering the herbs. Yes, they have, snow is predicted for tonight so some may not survive. It’s so wonderful that you’re incorporating garden fresh veggies to your feast, Norma. I find that so admirable. Sage is especially wonderful. Though I’m not doing the turkey for the first time this year, it’s one of my favorite herbs with it. Sage does go well with turkey and pork also. I add the frozen green leek parts to the pot when making soup or broth. Yep, despite the weather, in the end my garden surely came through for me and I may be harvesting root crops right into December. Hope your construction project is completed and Max has the yard all to himself again. Personally, I find leeks and scallions are interchangeable when using in cooking, using uncooked, I will use scallion and not leeks. I would not be so brave as to do consulting for people in their gardens but I would be more than happy to offer whatever help I can if you want to start a veggie garden, just ask when you are ready. Thanks, see you at LG’s Sunset Sensation. Wow, i guess the fresh herbs willmade a superb turkey stuffing!!!! Oh yes, nothing like fresh herbs. Herbs are easy to grow and takes little garden space. This looks fantastic, Happy Thanksgiving. Looks like a great harvest Norma! Love those leeks. Thanks, the leeks were small but delicious.